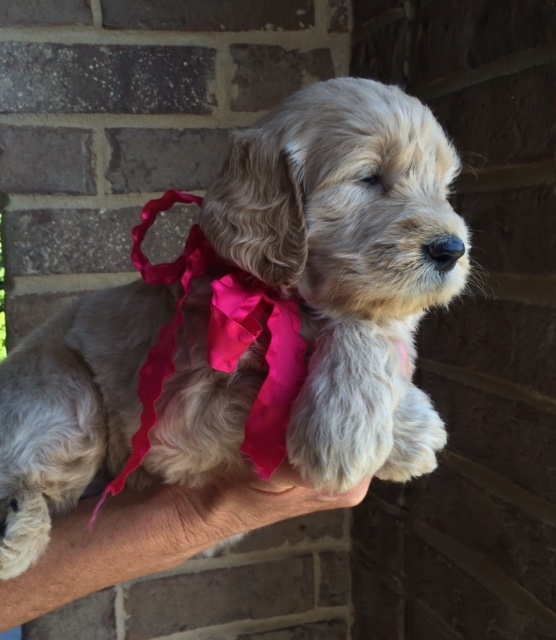 Goldendoodles come in a rainbow of colors. 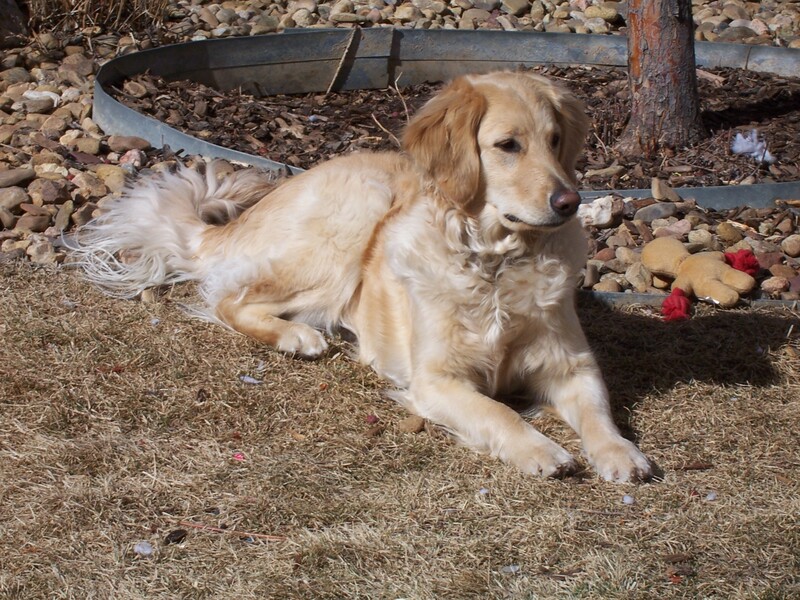 The Golden Retriever ancestry brings only shades of cream, apricot and red to the breed. These colors are all controlled by the same gene, with the shade of color determined by the intensity of the inherited gene. 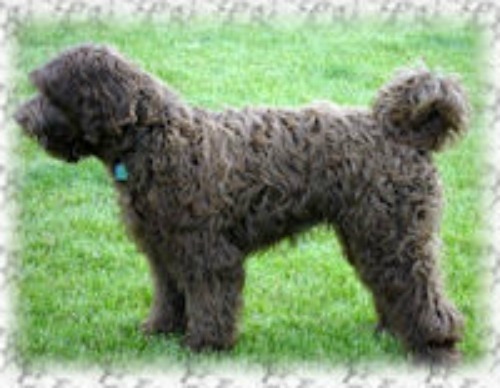 While the Poodle heritage also includes creams, apricots, and reds; Poodles alone lend the black, chocolate (dark brown), silver and gray coloring (and the color patterns) to the Goldendoodle coat. 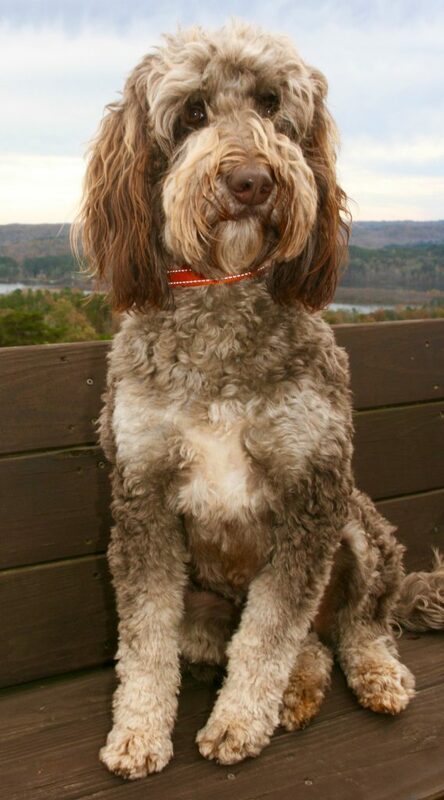 For even more variety, there are patterns of these colors found in the Goldendoodle, including parti, merle, phantom, and brindle. 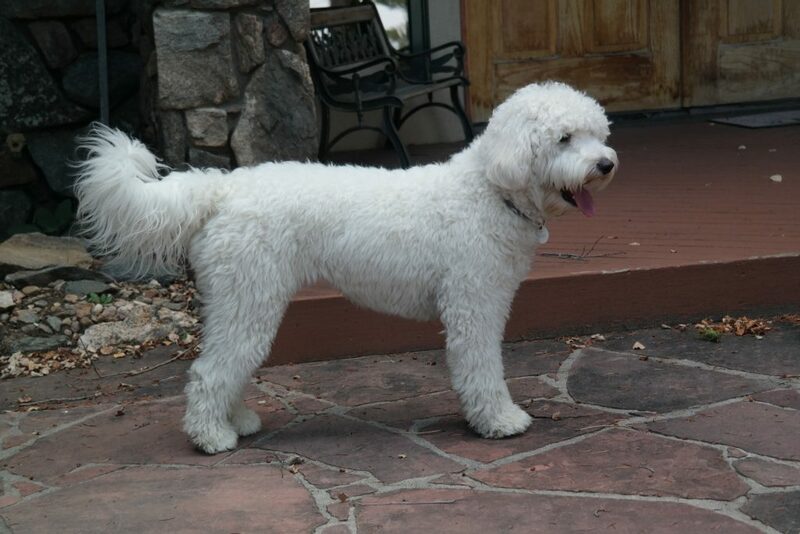 A parti colored Goldendoodle is at least 50% white, with solid patches of any other color. 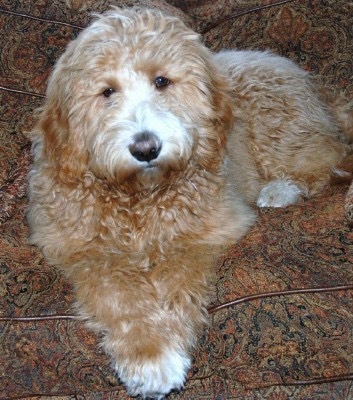 A solid color Goldendoodle with white markings that cover less than 50% of the body are known by several names: abstract, mismarks, or chrome. Merle is a varied coat pattern. 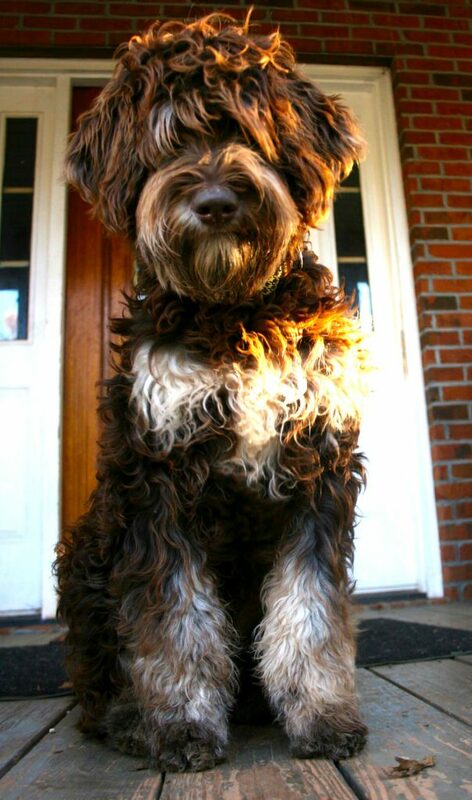 While a beautiful color, the merle gene can cause blindness and deafness if two parents carrying the merle gene are bred together, so merles should be bred only by very knowledgeable breeders who test for the merle gene and understand the genetics involved. Phantom’s have a specific pattern of markings on a solid background above each eye, on the sides of the muzzle, chest, inside the legs, and under the tail. Brindle patterns appear as stripes, the color and the width vary with each dog. 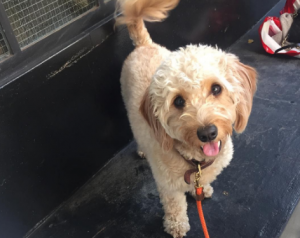 The primary concerns for any dog breeder must be health, temperament and conformation; but who can deny that the outward appearance of a Goldendoodle pulls at our heartstrings! 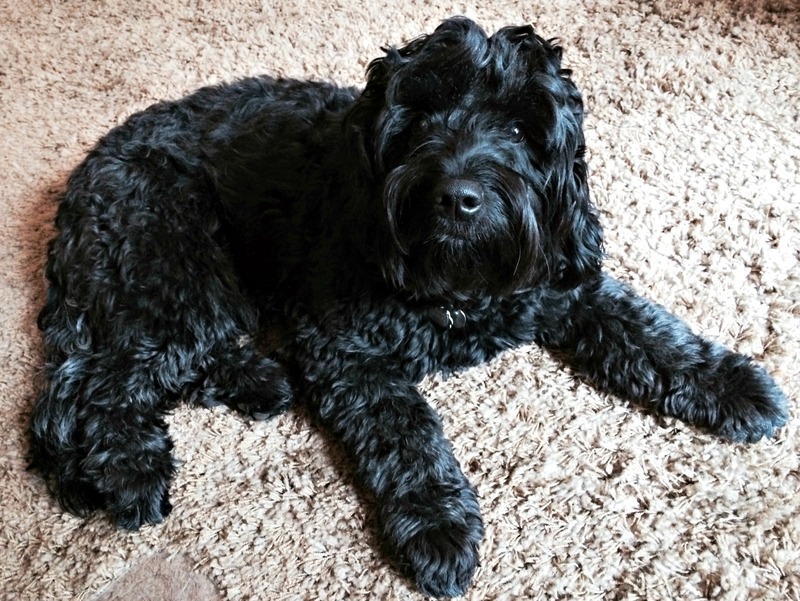 With careful breeding, breeders can now produce litters with predictable coat types and shedding propensities. 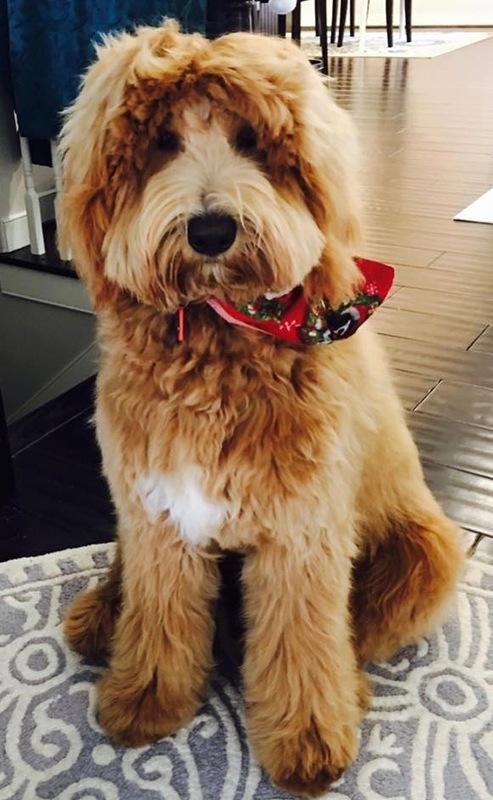 One of the things that many people find attractive about the Goldendoodle is the low shedding and hypo-allergenic qualities of the coat, and the adorable ragamuffin look of the Goldendoodle. DNA research now gives us information about how coat genes affect the “look” of a Goldendoodle. 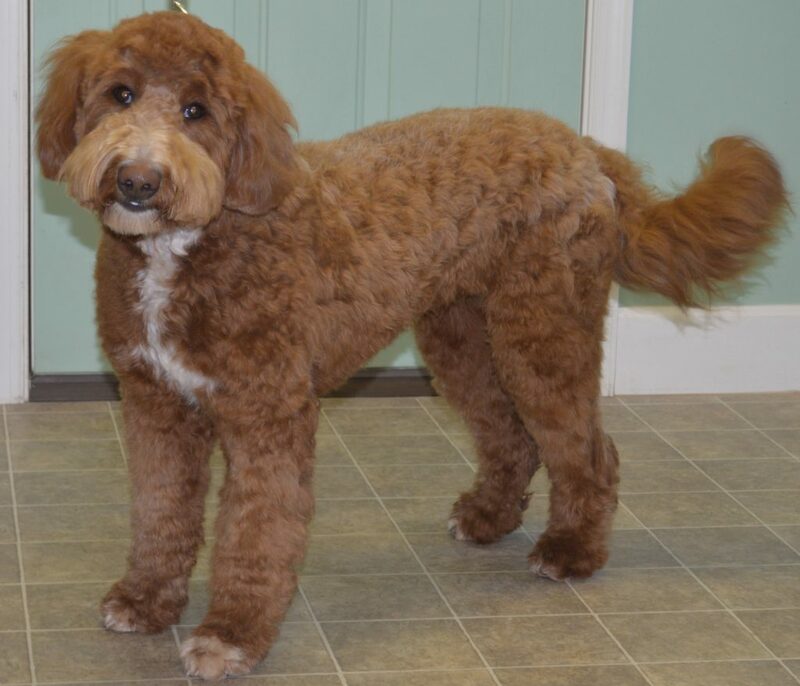 No longer do you need to rely on the generation of a Goldendoodle to determine appearance or shedding intensity! 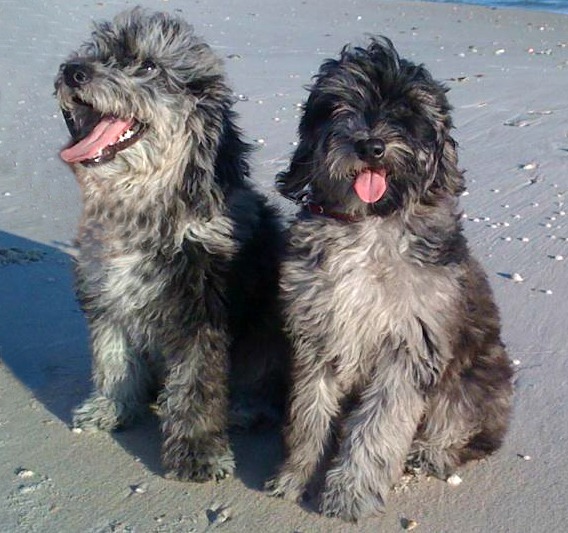 The coat length gene determines whether a dog has a long (L) or short (S) coat. 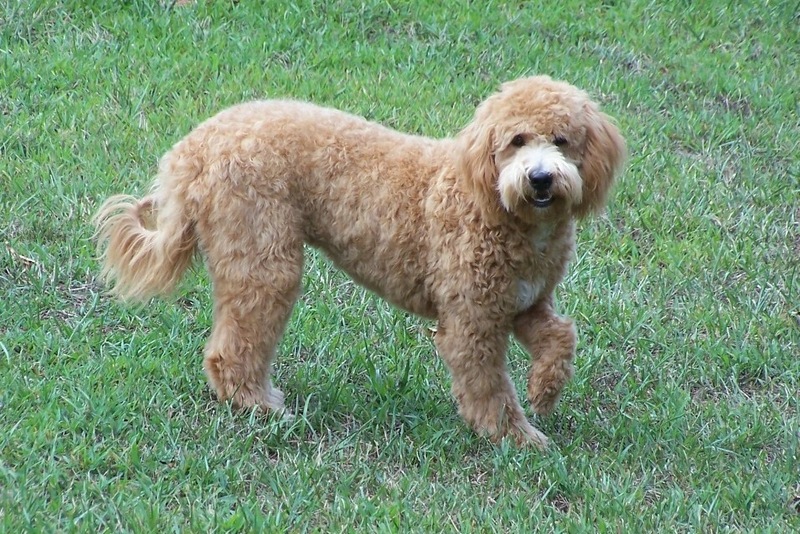 Although long coats are recessive, because both Goldendoodle parent breeds are long-coated, all Goldendoodles carry two genes for long coat (L/L). 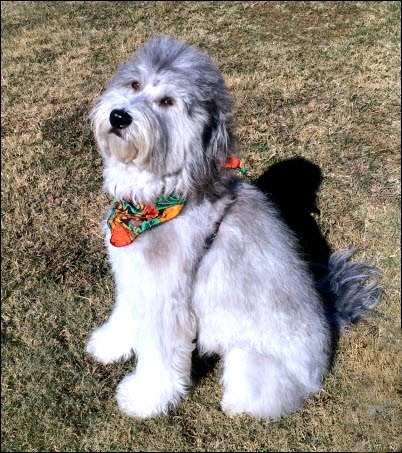 Since short coat is dominant, if a dog carries a gene for the short gene (S/L) their coat would be short. 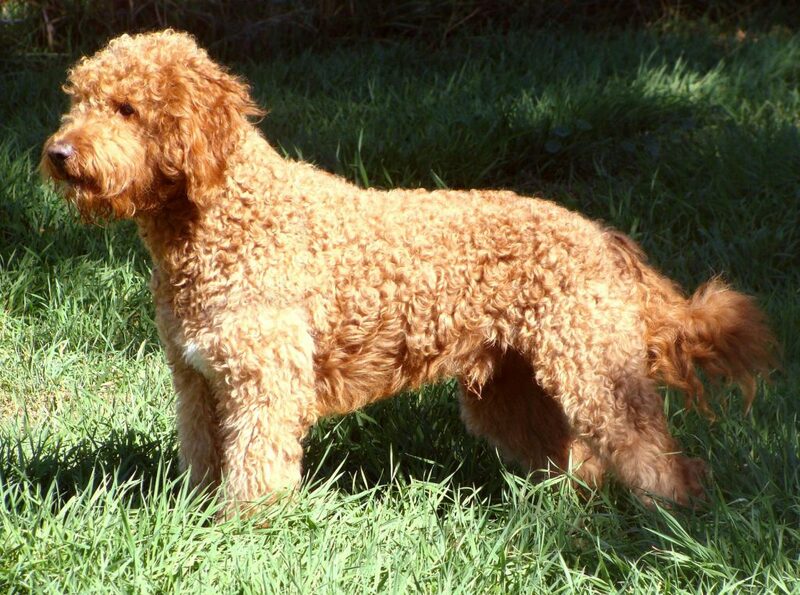 This is why some Labradoodles have short coats in the early generations, whereas Goldendoodles do not. 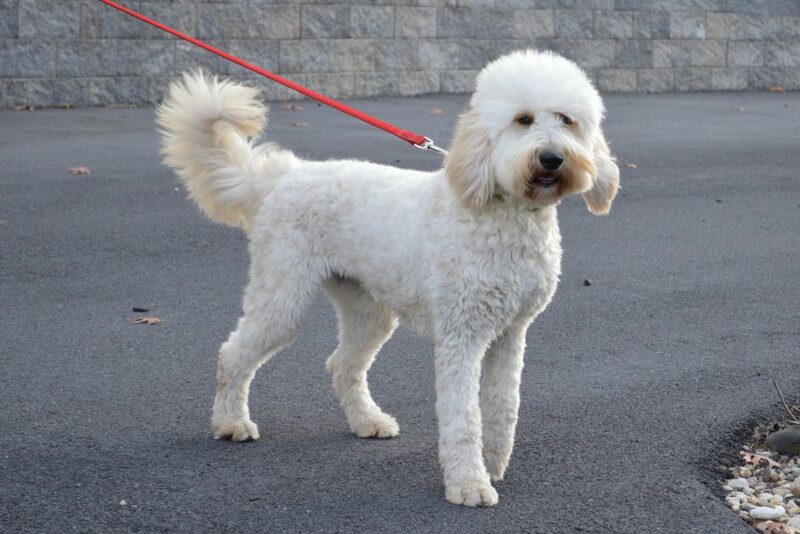 Goldendoodles can be curly, wavy, or straight. 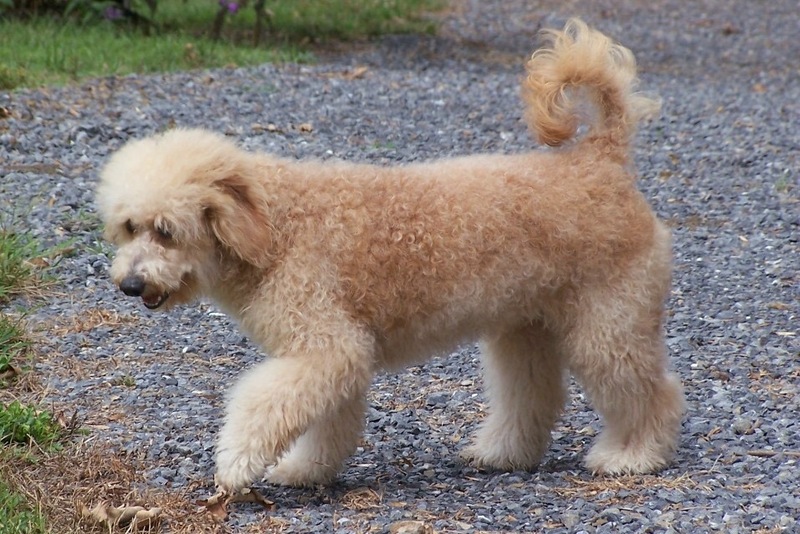 As you can see above, a Goldendoodle’s coat can have different amounts of curl. 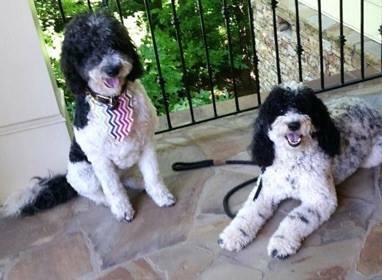 They inherit their number of curl genes from their parents. 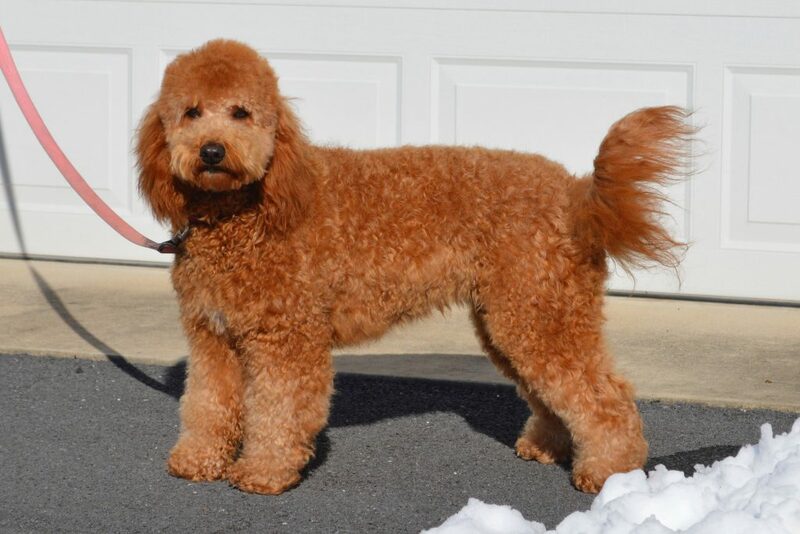 Typically a Goldendoodle that is curly is +/+ for curl, a flat or straight dog is -/- for curl, a dog with a wavy or loose curl coat is +/-. 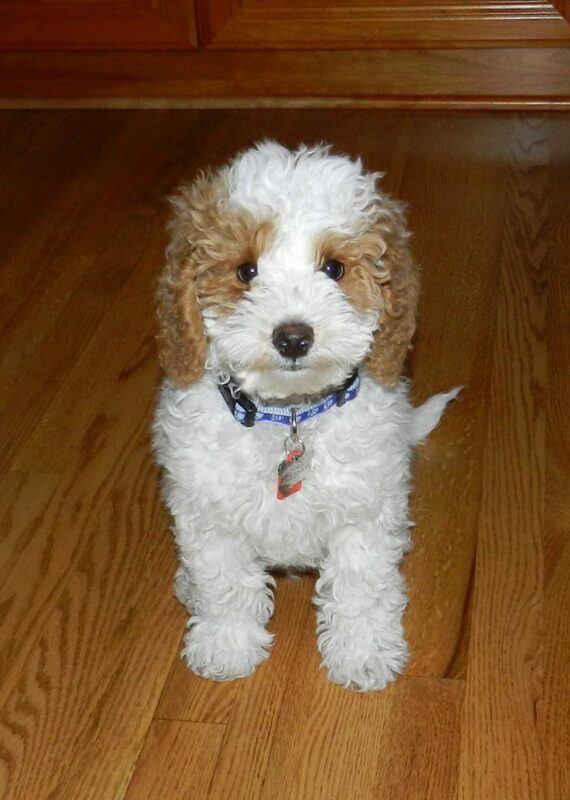 Since a wavy coated Goldendoodle can carry a curl gene (+/-), two wavy Goldendoodles bred together can produce all three coat types – curly, wavy, and straight. 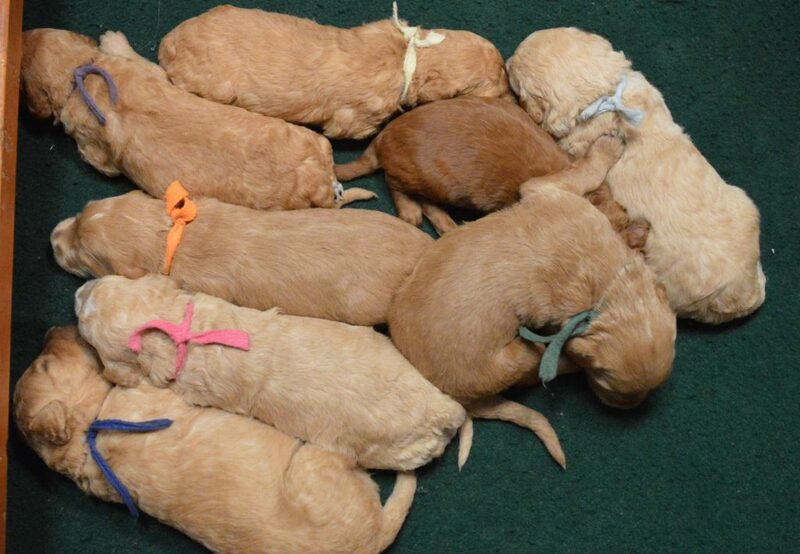 If a breeder tests the parent dogs for the curl gene, they can better predict the appearance of their puppies. What are Furnishings and Improper coat (gene RSP02)? 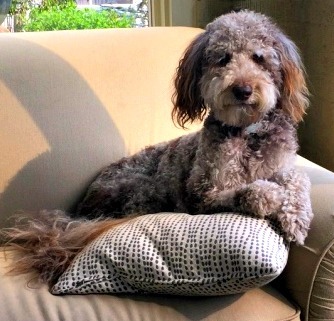 The Goldendoodles below lack “furnishings” and will shed more than a Goldendoodle with furnishings. 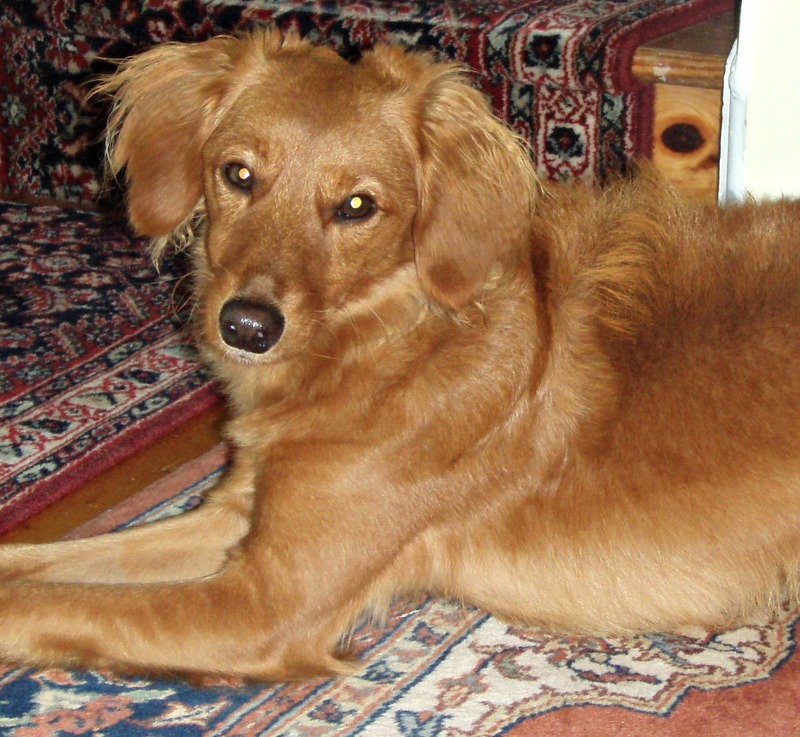 The “shedding index” is a combination of two DNA tests, one for the shedding gene, combined with the test for furnishings. 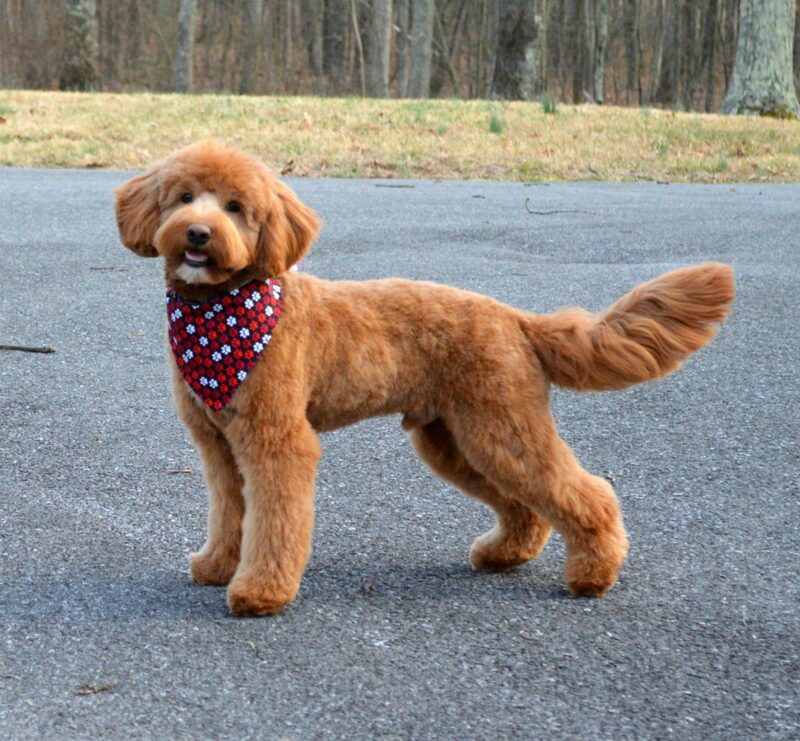 The shedding index is ranked on a score of 0-4. “0” is no shedding, and “4” is the highest shedding. 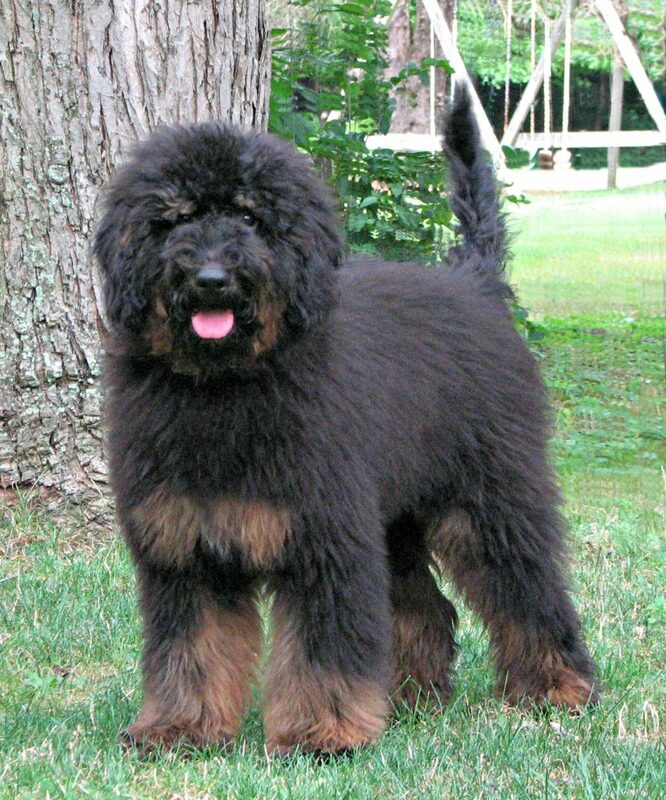 By testing for furnishings and shedding, a breeder can combine the results to reliably predict shedding in a dog. 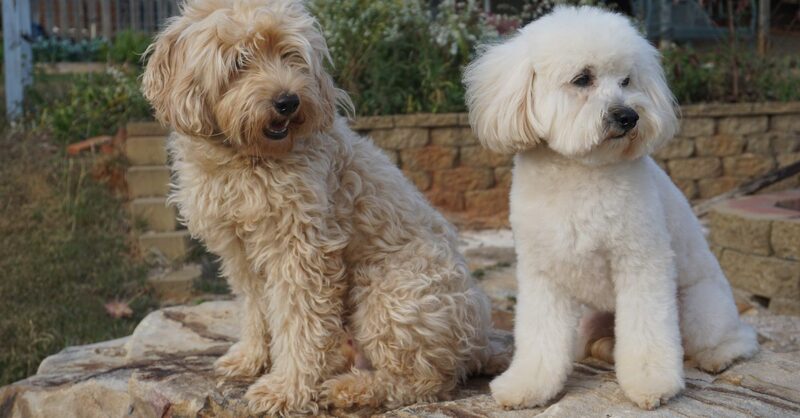 Selecting dogs with a low shedding index in a breeding program (after consideration for health and temperament) can produce puppies with reliably lower shedding coats. 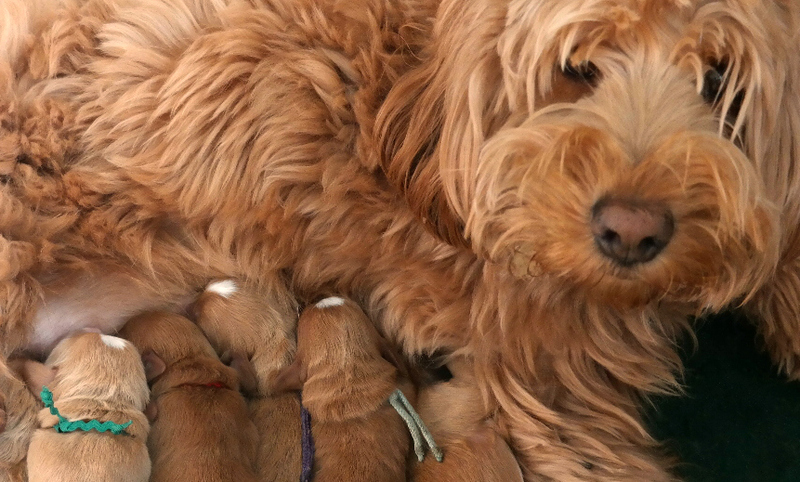 Since shedding is related to allergies, using these DNA testing tools on any generation Goldendoodle can help a breeder more accurately match puppies with families who have allergy concerns. 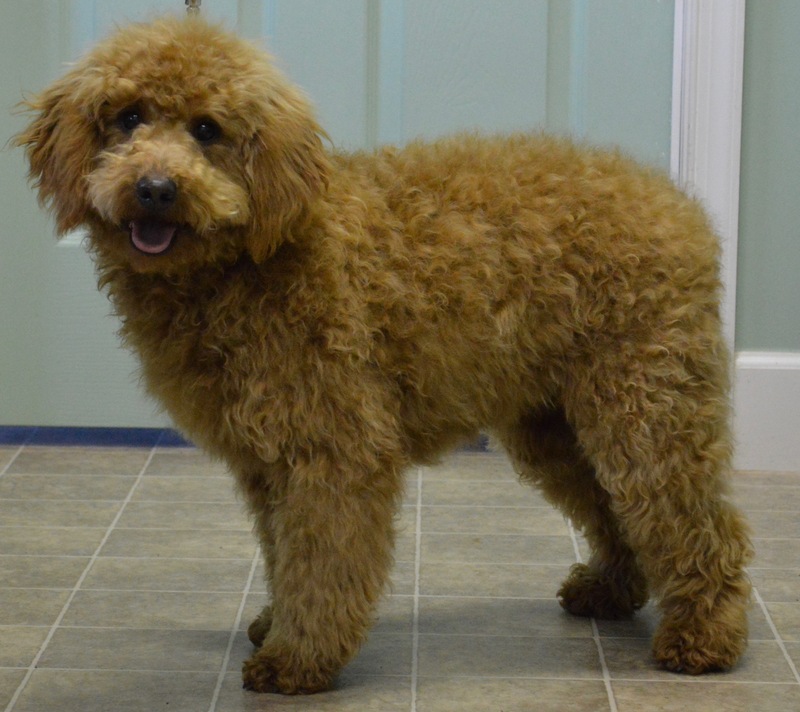 No longer do you need an F1b or a very curly Goldendoodle if you know the shedding index is low! 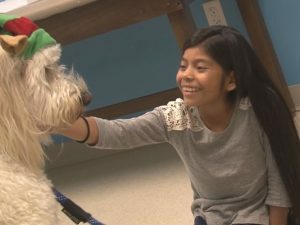 Note: Even a Goldendoodle with a shedding index of zero does not guarantee that you will not be allergic to a particular dog. 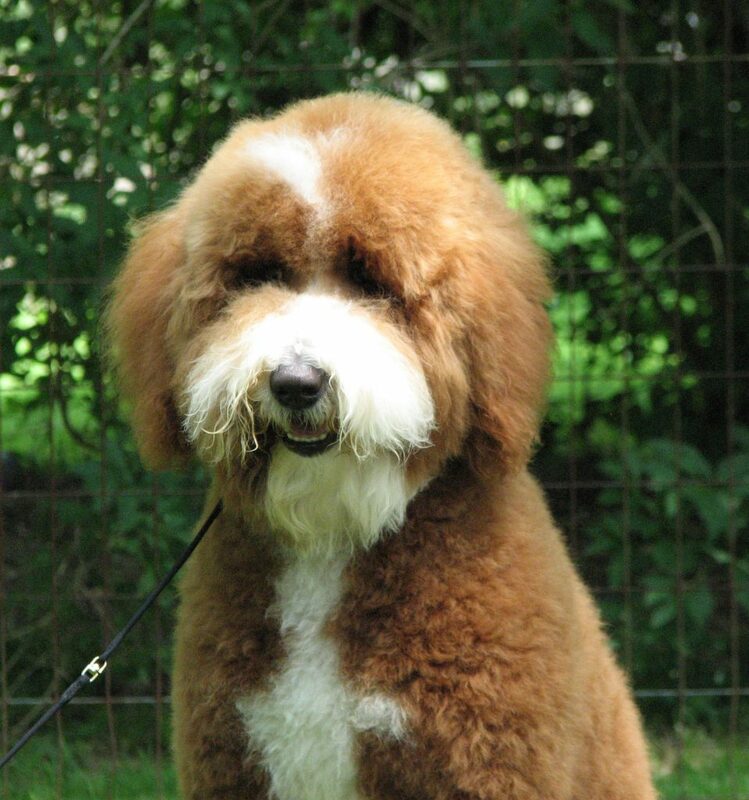 Allergies are very complex and shedding is just one of the components that factor in the equation. Consider that dander, saliva, proteins, and allergens carried on the dogs coat, etc., all contribute to each individual’s allergic reaction. 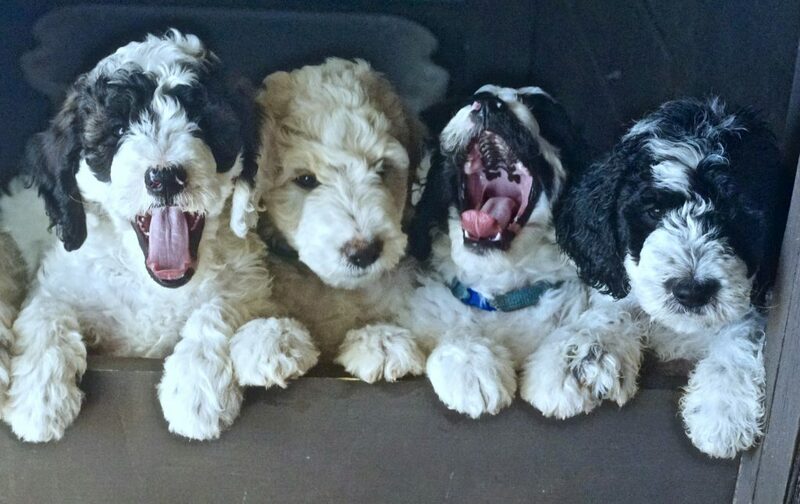 As you can see, there is a lot of science that goes into the selection of breeding mates to produce the ideal Goldendoodle. 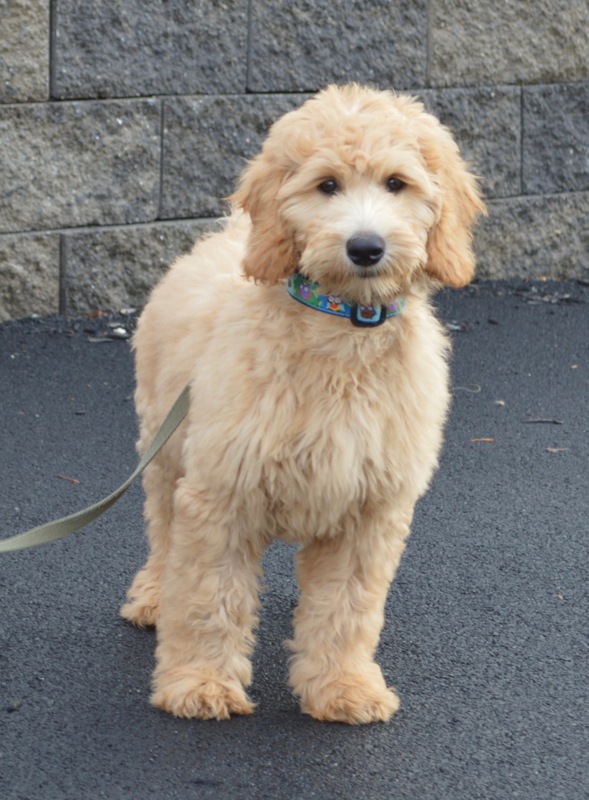 The Goldendoodle Association supports its Member breeders by providing access to the latest research and guidance from experts in fields such as breed development, canine reproduction, and puppy development. 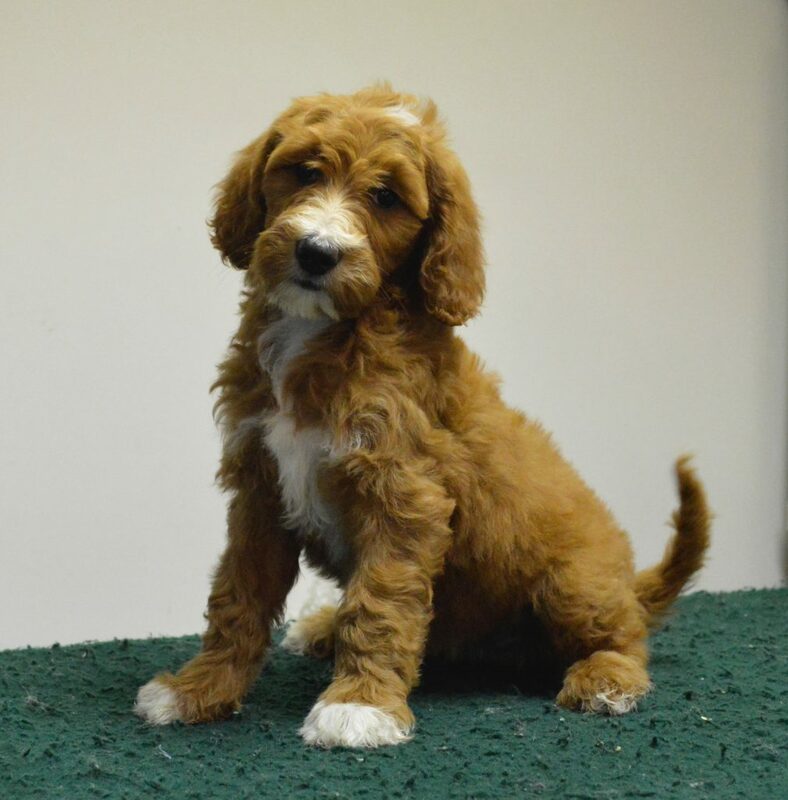 GANA’s goal is to guide the development of the Goldendoodle breed in the best possible way using current science and technology available to enhance health, raise puppies with the best possible temperaments, and avoid the mistakes of many of the AKC breeds regarding genetic diversity.